More construction takes place in China than anywhere else in the world. But along with this growth, there’s also a growing awareness of the environmental impacts that can come with some types of building. Now, as Chinese builders look to minimize the carbon footprints of new construction, they’re looking to Canada – and to Quebec in particular – for technology solutions and technical know-how. That has Canadian forest companies poised to benefit. One of the groups leading this push is Montreal-based FPInnovations, a non-profit organization that develops innovative solutions and carries out scientific research for Canada’s forest products industry. In October, FPInnovations signed an agreement with the Shanghai Research Institute of Building Sciences Group, a Chinese state-owned enterprise, to begin feasibility studies for the construction of multi-storey wood-framed carbon-neutral and carbon-negative buildings in China. 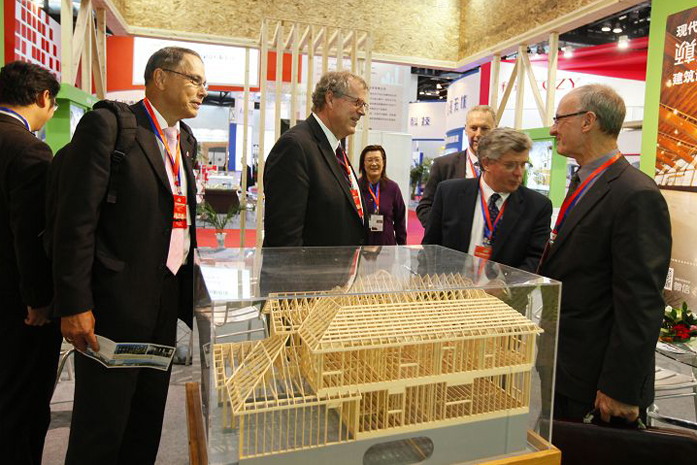 The goal of the agreement, which also includes three other Quebec-based organizations, is the construction of a six-story wood-frame building in Shanghai, which would be owned and operated by the Shanghai Research Institute of Building Sciences Group. The agreement was signed during a trade mission led by the premiers of Quebec, Ontario and Prince Edward Island. The federal government is also working to promote Canadian forest products in China and increase demand for higher value wood products in the country with the Canada Wood Export Program. Chinese imports of Canadian wood products are growing rapidly, increasing 24-fold between 2002 and 2012. In 2012, Canadian wood exports to China were worth $1.4 billion, however much of that was pulp and low-value timber. China isn’t the only Asian market where Quebec forest companies are seeing big opportunities. South Korea is also a big buyer of Quebec wood products, those exports were worth an average of $31.2 million a year between 2010 and 2012. That number is set to grow. On January 1, 2015, Korean import duties on the majority of Canadian wood products were eliminated, as part of a free-trade deal signed by the two governments in March 2014. All remaining Korean tariffs on Canadian wood products will be eliminated within the next 10 years. “The South Korean government’s focus on green policies, including sustainable housing, present opportunities for the promotion of Canadian wood as a green building material that is safe, modern, and cost effective,” according to the Canadian federal government’s Trade Commissioner Service. The need for safe, modern, cost effective and green housing solutions is a big part of the Shanghai agreement as well, where wood will be used to build higher buildings than ever before. The agreement will see the construction of a 12 to 15-story “research and testing tower,” which will be built with wood or hybrid systems, which use a combination of wood and other materials, like glass and concrete. For its part, FPInnovations will help support the project’s use of the Quebec building code, as well as providing scientific and technical support. This isn’t the first time that FPInnovations has collaborated with partners in China, it has worked with Chinese universities for years. In 2004, it contributed to the development of the Chinese Timber Structural Design Building Code. For more information on how sustainable wood products contribute to reducing the carbon footprint of new construction, see our previous blog post on Avoiding Carbon Emissions by Building with Wood.